No blitzkrieg for the Turkish army in Afrin. This is the conclusion of the first week since the launch of the “Olive Branche” operation to crash the Kurdish-majority SDF forces in the border area in northwestern Syria. The SDF- composed predominantly of the YPG Kurdish fighters whom Turkey considers a terrorist group on equal footing as the PKK- has launched a counter-attack that has so far obstructed the march of the Turkish army denying them a swift victory despite their superiority. Turkish officials admit that it will take time to drive the YPG forces out of the Afrin enclave north of Aleppo. So far the Turkish offensive has captured only a few villages close to the border in three days of fighting and there are a total of 350 villages in Afrin. The Syrian Observatory for Human Rights said that there had been a strong Kurdish counter-attack overnight that had recaptured two villages called Shenkal and Adamaly. If the ground offensive drags on in Afrin, it would deal Turkey a heavy diplomatic blow and may even embolden the Kurdish PKK rebels to open another front in eastern Turkey. 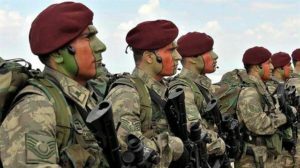 The Olive Branche Operation has pitted Ankara against Washington, which does not consider the SDF forces as a terrorist organization but rather as allies on the global war on ISIS. The US has even offered support for an SDF force of 30,000 soldiers. The move angered Turkey and triggered its wrath against the Syrian Kurds. France, for its part, has called for an emergency meeting of the UN Security Council to discuss the fighting in Afrin and other parts of Syria. Britain said it would look for ways to prevent escalation. The Turkish ground offensive on Afrin would cause more displacement with most of refugees expected to seek shelter in neighboring Turkey. Written by: Jaber Ali on January 23, 2018. Posted by Jaber Ali on Jan 23 2018. Filed under Headlines, World News. You can follow any responses to this entry through the RSS 2.0. Both comments and pings are currently closed.